Hanshaw, Oliver, head-of-household, age 33, born in Missouri; father born in Ohio; mother born in Illinois; first marriage, married 3 years; occupation: farmer, general farm; rented farm. Hanshaw, Jessie, wife, age 33, born in Kansas; father born in Missouri; mother born in Kansas; first marriage, married 3 years; 1 child, 1 living. Hanshaw, Annette, daughter, age 2, born in Missouri; father born in Missouri; mother born in Kansas. 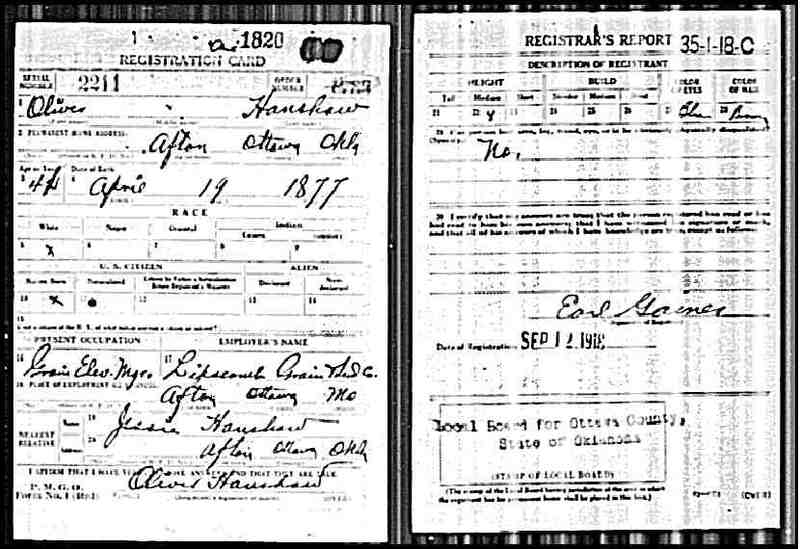 Henshaw, Oliver, head-of-household, age 43, born in Missouri; father born in Ohio; mother born in Illinois; owned home; occupation: grain dealer, [..unclear..]. Henshaw, Jessie, wife, age 33, born in Kansas; father born in Missouri; mother born in Kansas. Henshaw, Annetta, daughter, age 12, born in Missouri; father born in Missouri; mother born in Kansas; attended school. Henshaw, Gladys, daughter, age 9, born in Missouri; father born in Missouri; mother born in Kansas; attended school. Henshaw, Ellis, daughter, age 7, born in Missouri; father born in Missouri; mother born in Kansas; attended school. Henshaw, Chas. Henry, son, age 5, born in Oklahoma; father born in Missouri; mother born in Kansas. Henshaw, William, son, age 2, born in Oklahoma; father born in Missouri; mother born in Kansas. Hanshaw, Oliver, head-of-household, age 52, born in Missouri; parents born in Illinois; first married at age 29; rented home ($35.00 rent); no radio in home; occupation: [..unclear..] builder, bridge concrete work; not a veteran. Hanshaw, Jessie, wife, age 44, born in Kansas; parents born in Missouri; first married at age 21. Hanshaw, Aneta, daughter, age 22, born in Missouri; father born in Missouri; mother born in Kansas; occupation: file clerk, electric company. Hanshaw, Gladys A., daughter, age 19, born in Missouri; father born in Missouri; mother born in Kansas; occupation: clerk office, telegraph company. Hanshaw, Mary E., daughter, age 17, born in Missouri; father born in Missouri; mother born in Kansas; occupation: office girl, lawyer's office. Hanshaw, Charles H., son, age 15, born in Oklahoma; father born in Missouri; mother born in Kansas; attended school. Hanshaw, William O., son, age 13, born in Oklahoma; father born in Missouri; mother born in Kansas; attended school. 1910 census, Preston Township, Jasper County, Missouri; roll T624-792, ED 79, page 81A, line #2, dwelling #276, family #276. 1920 census, Afton, Afton Township, Ottawa County, Oklahoma; roll T625-1481, ED 107, page 3A, line #45, dwelling #38, family #39. 1930 census, Dallas, Dallas County, Texas; roll T626-2315, ED 41, page 19B, line #78, dwelling #63, family #98.